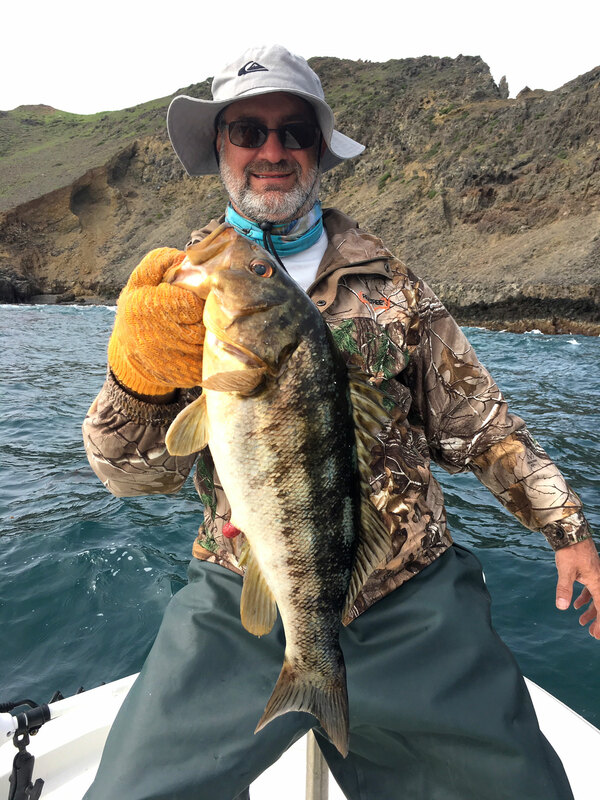 RTF Saltwater Guide trip 04/05/2019 - Met up with PJ and his grandson who is visiting from Washington on Friday morning for an early season spring day of fishing. On the idle out of the harbor, PJ said that they had two goals they wanted to try to achieve for the day. First one being that he had never caught a White Sea bass before and was hopeful we could change that. The second was that his grandson had a personal record of the most amount of fish caught in one day previously being 13 and he wanted to try and beat that. With optimism to achieve these two goals, we set out on beautiful lake like conditions and made the crossing to the Channel Islands. First thing once getting to the island was searching for the right conditions. It took some patience and a little while to find the right stuff but the guys hung in there and once we found a kelp line looking just right, PJ followed directions perfectly and connected on his first ever White Sea bass. Stoked! Within the following hour we had limits of White Sea bass on the boat and were off to a great start with one of the two goals being accomplished. We plunked at some eager calico bass for a little while after that put on a very visual show with hooked bass coming up with followers trying to steal the bait out from the mouths of the others. Very fun fishing. The guys then wanted some fish to take home with their sea bass for tacos so we finished up catching very shallow water rockfish and limits of lingcod on light line in under 100 feet of water. This is where the second goal was achieved as the personal record of thirteen fish was broken. With lots of fish to take home, we pointed the boat back towards the harbor and headed home on the calm channel. Awesome day with even more awesome people. Just goes to show that you don’t have to wait for giant fish counts from Sportfishing boats to make the decision to go fishing or not. The best trips come from people who have zero expectations and go fishing just simply because they like the sport and want to enjoy the day. Thanks for booking a trip PJ, I had a great time with you guys, let’s do it again. Cheers. Saltwater Fishing Charter 02/12/2019 - Just got off the water here it is Tuesday evening February 12, 2019. Took my great friend John Waller to fish the Channel Islands today. Not a single trailer in the parking lot. Never saw another fishing boat Anacapa or Santa Cruz Island. Caught and released over 30 calico bass up to 4 pounds. Just absolutely wide-open fishing and really nice weather conditions on the way out and on the way home. All the fish were caught “Up and In”. Caught them on just about every plastic that we fished in less than 10 feet of water. 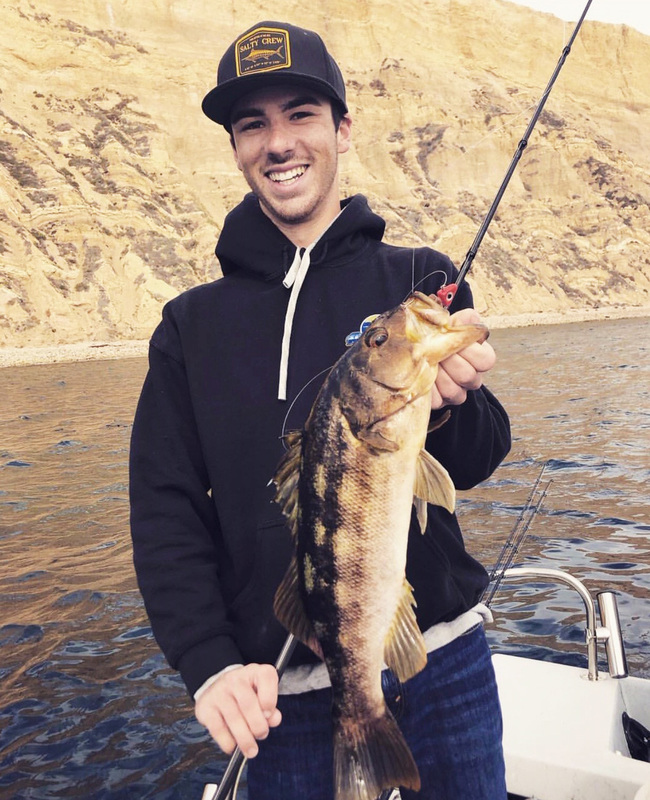 Anglers interested in booking their saltwater calico bass fishing trip with Captain Jake Klinshaw can call or text me at 818-439-1154. Met up with PJ and his grandson who is visiting from Washington on Friday morning for an early season spring day of fishing. On the idle out of the harbor, PJ said that they had two goals they wanted to try to achieve for the day. First one being that he had never caught a White Sea bass before and was hopeful we could change that. The second was that his grandson had a personal record of the most amount of fish caught in one day previously being 13 and he wanted to try and beat that. With optimism to achieve these two goals, we set out on beautiful lake like conditions and made the crossing to the Channel Islands. First thing once getting to the island was searching for the right conditions. It took some patience and a little while to find the right stuff but the guys hung in there and once we found a kelp line looking just right, PJ followed directions perfectly and connected on his first ever White Sea bass. Stoked! Within the following hour we had limits of White Sea bass on the boat and were off to a great start with one of the two goals being accomplished. We plunked at some eager calico bass for a little while after that put on a very visual show with hooked bass coming up with followers trying to steal the bait out from the mouths of the others. Very fun fishing. 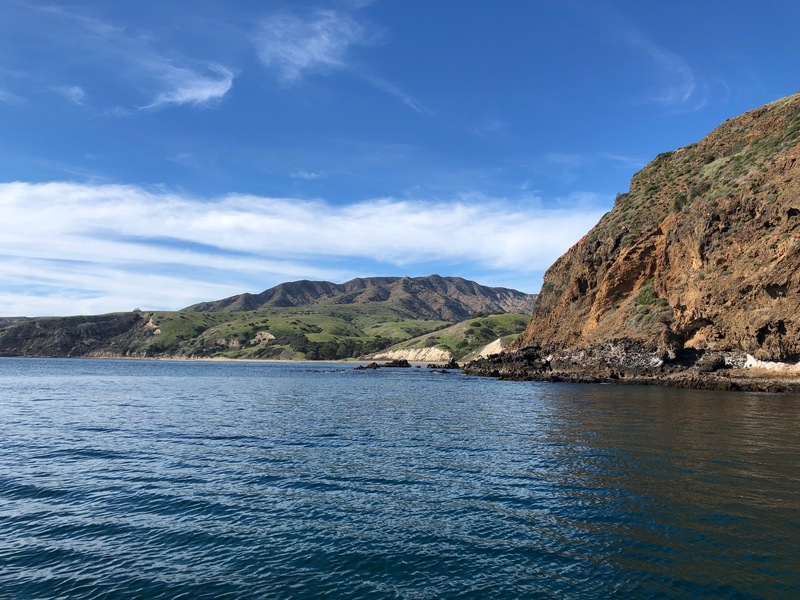 The guys then wanted some fish to take home with their sea bass for tacos so we finished up catching very shallow water rockfish and limits of lingcod on light line in under 100 feet of water. This is where the second goal was achieved as the personal record of thirteen fish was broken. With lots of fish to take home, we pointed the boat back towards the harbor and headed home on the calm channel. Awesome day with even more awesome people. Just goes to show that you don’t have to wait for giant fish counts from Sportfishing boats to make the decision to go fishing or not. The best trips come from people who have zero expectations and go fishing just simply because they like the sport and want to enjoy the day. Thanks for booking a trip PJ, I had a great time with you guys, let’s do it again. Cheers. Just got off the water here it is Tuesday evening February 12, 2019. Took my great friend John Waller to fish the Channel Islands today. Not a single trailer in the parking lot. Never saw another fishing boat Anacapa or Santa Cruz Island. Caught and released over 30 calico bass up to 4 pounds. Just absolutely wide-open fishing and really nice weather conditions on the way out and on the way home. All the fish were caught “Up and In”. Caught them on just about every plastic that we fished in less than 10 feet of water. 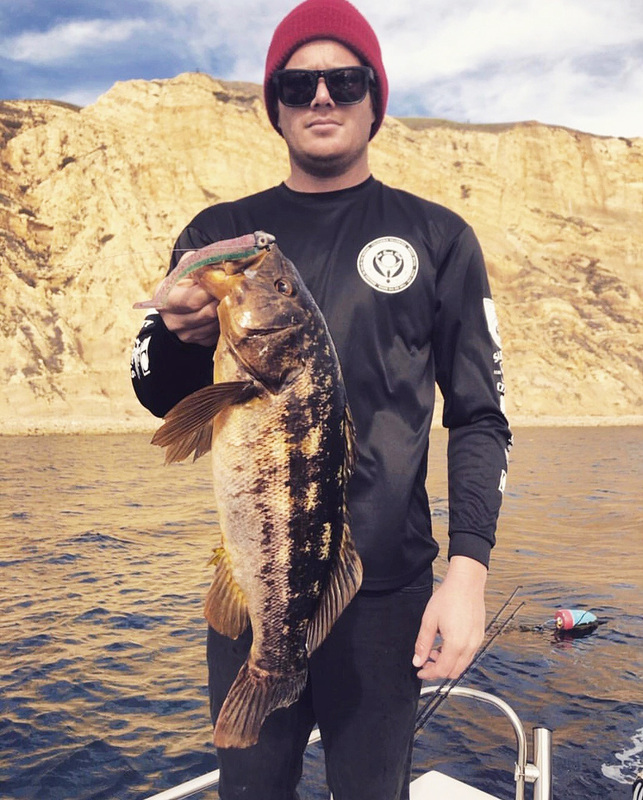 Anglers interested in booking their saltwater calico bass fishing trip with Captain Jake Klinshaw can call or text me at 818-439-1154.